On his 93rd birth anniversary, ThePrint remembers the achievements of Jadhav, who won a bronze medal in wrestling at the 1952 Helsinki Olympics. Khashaba Dadasaheb Jadhav was India’s first athlete to win an Olympic medal in an individual sport. Yet, in the country’s sporting history, he remains the only Olympic medallist to have not been honoured with a Padma award. Jadhav’s journey to the 1952 Helsinki Olympics was far from a smooth ride, but he went on to make India proud by winning a bronze medal in wrestling. On his 93rd birth anniversary, ThePrint remembers the achievements, struggles and legacy of the forgotten sportsman. Jadhav was born on 15 January 1926 in Satara to a Maharashtrian family which was well-immersed in the world of wrestling. His father Dadasaheb, also a wrestler, noticed the potential Jadhav had when he introduced him to the sport at the tender age of five. The rising wrestling champion hardly let anybody take him down despite having a non-sturdy build. He attended Tilak High School in Karad, a couple of kilometres from his village for primary education. In 1948, while studying at Kolhapur’s Raja Ram College, Jadhav approached his principal seeking permission to participate in the annual sports meet after his sports teacher rejected him looking at his physique. When finally allowed, his game stunned many as he knocked down the bulkiest of players. 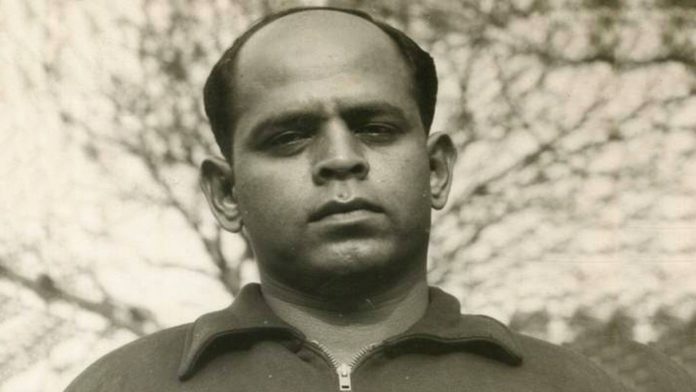 During his initial training years, before he went on to represent India at the 1948 and 1952 Olympic Games, Jadhav was trained by wrestlers Baburao Balawde and Belapuri Guruji. Jadhav didn’t compromise his education to pursue his passion but continued to play at state and national levels. The 1948 Summer Olympics held in London might not have offered a medal to the young wrestler, but he surely impressed audiences with those matches where he defeated his opponents within minutes. Finishing sixth in the freeweight category was a major feat for an athlete who had just got the first taste of playing a match on the professional mat. The 1948 Games set the tone for Jadhav for the next Olympics in Helsinki, Finland, as he was more determined to win a medal for his country. But, before the 1952 Olympics, Jadhav faced both financial as well as technical obstacles. Jadhav had to fight rival Niranjan Das more than twice to be able to represent his country. It is believed that it was at the behest of the Maharaja of Patiala, after Jadhav wrote to him, that a third bout was organised between Jadhav and Das. He knocked Das down yet again and was chosen to participate at the 1952 Olympics. But Jadhav still lacked finances to fund his stay there. His college’s principal arranged a sum of Rs 7,000 as he mortgaged his own house. Other people too contributed and took care of other requirements. At Helsinki, Jadhav astonished everybody with his easy wins in the first five rounds of the bantamweight freestyle wrestling category. But his next competitor, Japan’s Shohachi Ishii, took him down. According to the rules, Jadhav should have been given 30 minutes to rest before his next bout against with Russia’s Rashid Mammadbeyov. But since not a single Indian official was present to put forward his case, Jadhav didn’t get the time. The exhausted wrestler lost the match but bagged the bronze medal to become the first Indian athlete to win a medal in an individual sport at the Olympics. On his return, Jadhav was felicitated by Desai in Bombay (now Mumbai). Jadhav could not try for the next Olympics due to an injury and instead took on the role of a sub-inspector in state police in 1955. He resigned in 1983 as an assistant commissioner of police in Maharashtra. Successive governments failed to award Jadhav with a Padma award. He died in an accident in 1984. Jadhav was awarded the Arjuna Award posthumously in 2001. Pune-based writer Sanjay Dudhane came out with a biography on him, titled Olympicveer Khashaba Jadhav, the same year. In 2010, the wrestling stadium at the Indira Gandhi Sports Complex in the national capital was renamed the K.D. Jadhav Stadium after the wrestler.